The South Island usually receives the lion’s share of attention in New Zealand tourism, and this isn’t undeserved. There’s picturesque mountains, stunning lakes, and miles of pristine wilderness. But this doesn’t mean the North Island doesn’t deserve a look in! It’s better for travellers to think of the two islands as oranges and apples. It isn’t really fair to compare them because their offerings are so different. A visit to New Zealand isn’t truly complete without experiencing what each has to offer. One place you should absolutely add to your list is Gisborne; with fantastic scenery, surf and vineyards, there’s something here for every traveller! In many ways, Gisborne epitomises the very best of the North Island. Its warm steady climate, beautiful beaches and lush rolling countryside are a contrast to the stark, rugged beauty you often find in the South. Sitting high on the northeastern coast of the North Island, it’s a taste of a different side of New Zealand. Here, you will find a year-round holiday vibe. Its tagline, ‘the Land of First Light’ refers to how Gisborne is the first town in the world to see the sunrise each day (at least during New Zealand’s summer months!) If you are an early riser who loves to make the most out of each day, you will find plenty here to occupy you! If there’s one thing that Gisborne is famous for, it’s award-winning wines! The warm dry climate of the region, with its cooling ocean breezes, is absolutely perfect for viticulture. 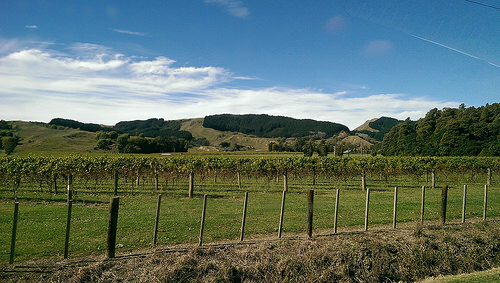 The town has become home to the 4th largest wine-growing area in New Zealand in just a few decades. Its different soils allow for growing a huge range of grape varieties, so Gisborne has a wealth of cellar door tastings. Whether you love a great Chardonnay or a Merlot, you’ll find a fantastic offering here. If you’re in this area, a visit to the Millton Boutique vineyard is a must-do for wine lovers. IThe vineyard is family-owned and has been operating in Gisbourne since 1984, when New Zealand’s wine industry was in its infancy. It’s hard to believe this today when New Zealand is so famous internationally for wine, but many of the big names such as Brancott Estate are barely a decade old! Millton is truly a veteran at its craft. 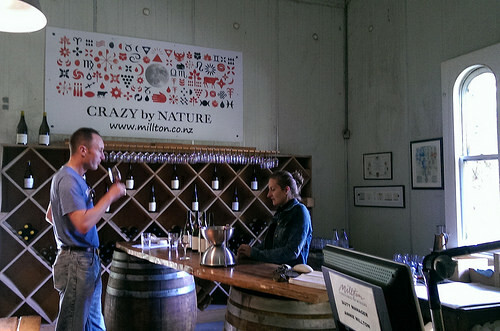 The Millton tasting room is humble and intimate, without the grandeur of the commercially-run wineries. You’ll get a personalised experience, without the usual jostling crowds you often find in the bigger wine regions like Marlborough and Central Otago. Their wines are organic, and mouth-wateringly delicious! 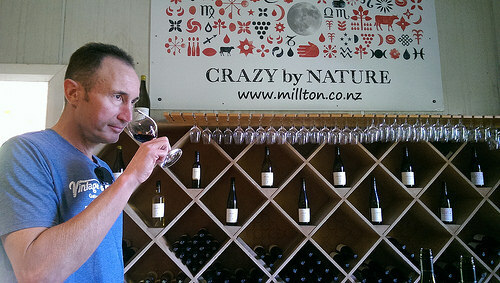 Millton’s head winemaker, James Millton, belongs to the ‘Family of Twelve’. This is a prestigious and tightly-bound group of New Zealand winemakers who are committed to perfecting their craft. 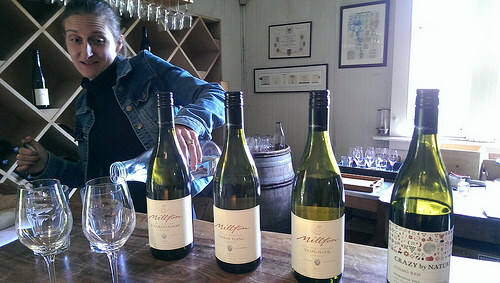 Rebecca, our tasting rep for the day, was thrilled when I fell in love with the Chenin Blanc. James would have been pleased; it’s his favourite too! This is the kind of boutique experience that we really encourage visitors to include in their New Zealand itineraries. We love the bio-diversity and organic philosophy that goes into boutique vineyards, especially around Gisborne. They maintain a very distinct character as ‘local’ offerings, compared with the more famous vineyards which often have less time to spend with patrons. It’s one of those pursuits where you can relax, take your time, and hopefully learn some very interesting things about viticulture! On the way out Rebecca invited us to meet one of Millton’s hand-reared calves. 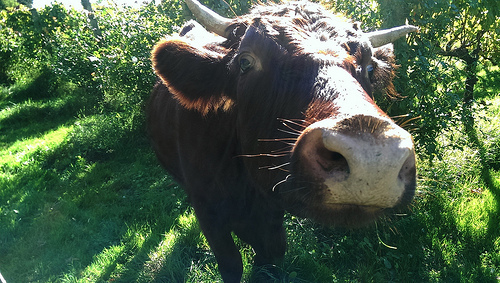 What a friendly chap, but hardly a calf! For something really nature-focused, there’s no better way to end a day in Gisborne than a stroll down one of its beautiful beaches. 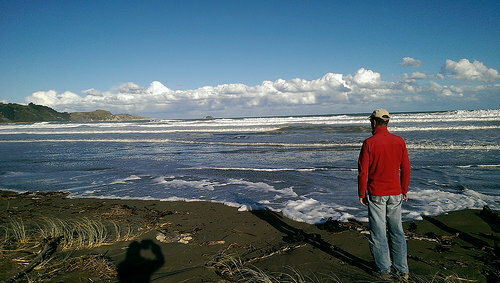 These beaches are wild and dramatic, and contain some of greatest surf in New Zealand. The sound of crashing waves is terrific and thrilling! If you consider yourself a bit of a photographer, you will get some fantastic time-lapses here. You have several options pretty close to the town, as well as further up the coast. 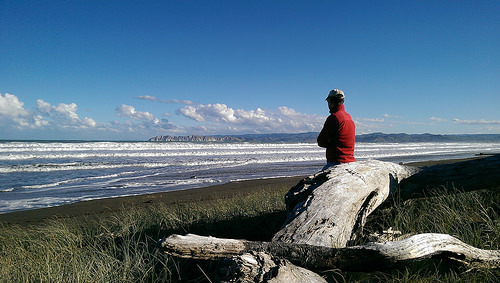 Straight off Roberts Road in the centre of Gisborne, you have access to the main beach. This is great if you are staying locally, or just want to spend an hour or two during your visit! If you are wanting to go a bit further afield, the spectacular multi-layered surf at Makarori Point provides plenty of drama. This is just over the hill from Okitu, just a 1o-minute drive up the coast from Gisborne. If you are after a more remote beach experience without hustle and bustle, this is a great place to find it. Travelling can sometimes feel hassled and fast-paced, so grabbing these moments while you can allow you to take a breath. Michael loves quiet beach moments, so we’ll just linger for a while. For more profound nature experiences, see our nature and lifestyle itineraries. Yes, it does have that great wild, untamed look.I could imagine in the middle of summer it would be amazing to see all the surfers doing their thing here (Now that would make a great photo). So many beautiful beaches in this country.